New Man Utd boss David Moyes (left) applauds Robin van Persie after the Dutch striker's second goal against Swansea City on Saturday. Van Persie and Danny Welbeck both scored twice in a 4-1 win. Robin van Persie lashes in his second goal against Swansea City. The Dutch striker left Wayne Rooney in the shade yet again. The unsettled English striker came on as a second-half substitute but failed to score. Aston Villa's Christian Benteke celebrates scoring his second goal from the penalty spot. Teammate Antonio Luna (right) scored a late third to send Arsenal crashing to an opening day 3-1 defeat at the Emirates. 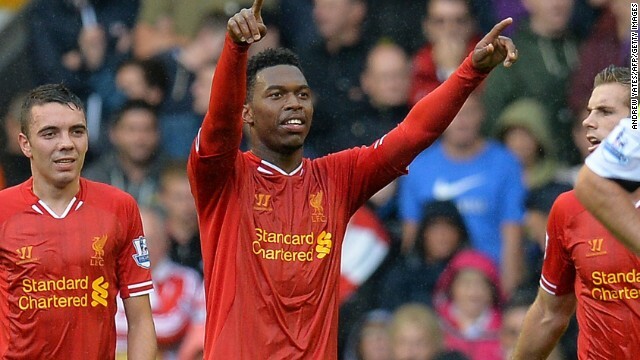 Daniel Sturridge celebrates after scoring Liverpool's opening goal at Anfield on Saturday. 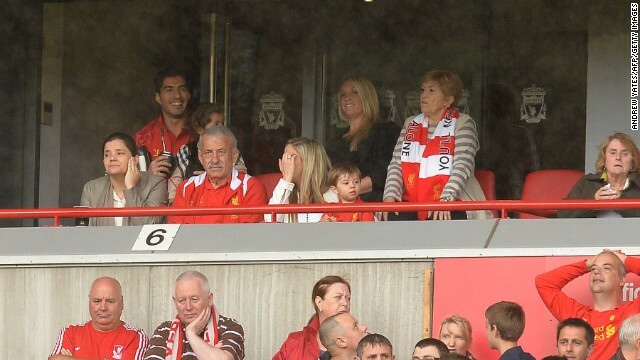 A smiling Luis Suarez (back left) attends Liverpool's opening fixture of the Premier League season. The Uruguayan striker is serving the fifth game of a 10-match ban for biting Branislav Ivanovic in a match against Chelsea last April. Suarez's future at Liverpool is in doubt following an acrimonious summer in which the striker has agitated for a move away from Merseyside. Liverpool insist the player is not for sale. The English Premier League will use a new "Goal Decision System" this season. 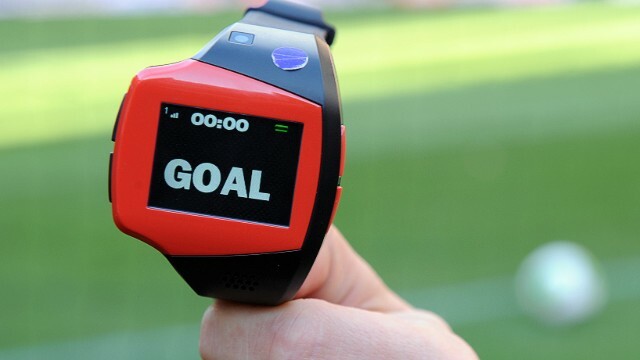 A wrist watch will immediately tell the referee if a goal has been scored or not. The technology developed by Hawk-Eye Technologies uses 14 cameras strategiacally placed around the stadium to determine the exact path of the ball. (CNN) -- Manchester United's new manager David Moyes started the new English Premier League campaign with a resounding 4-1 win away to Swansea City on Saturday. The reigning champions struck twice in each half to ease to victory in what was considered a potentially tricky first fixture for Moyes on the opening day of the new season. Blog: Can Moyes meet Man Utd challenge? Robin van Persie carried on from where he left off last year hooking a right-foot shot past Swansea keeper Michel Vorm in the 34th minute. Danny Welbeck doubled the lead two minutes later, tapping the ball home from an Antonio Valencia cross. Unsettled striker Wayne Rooney received a mixed reception when he came on as a second-half substitute and had to play second fiddle to van Persie yet again. The Dutch striker scored a superb second in the 72nd minute, ending a fabulous solo effort with a rasping left-foot drive. Striker Wilfried Bony scored a consolation goal for Swansea ten minutes later before Welbeck added a fourth goal moments before the final whistle. There was no first day celebrations for Arsenal as they slumped to a 3-1 defeat against Aston Villa at the Emirates. Christian Benteke scored a brace for Villa with Antonio Luna adding a late third after Villa had gone a goal down early in the game. Olivier Giroud gave the Gunners the lead in the sixth minute but Benteke leveled the scores with a header in the 22nd minute. The 22-year-old Belgian international converted from the penalty spot in the 61st minute to put Villa in front before Luna completed a miserable opening day for Arsenal fans with a strike five minutes from the end. Liverpool kicked off the new season with a 1-0 win against Stoke City at Anfield. A first-half goal by Daniel Sturridge was enough to earn the Reds all three points despite a spirited performance from Stoke, watched by new manager Mark Hughes. The home side were supported by a full house at Anfield that included Luis Suarez, who is serving the fifth match of a ten-game ban for biting Chelsea's Branislav Ivanovic in April. The Uruguayan's future at the club remains in doubt with Suarez agitating for a move away from the club he joined in January 2011 so he can play Champions League football. But bids from Arsenal in excess of £40 million ($62 million) have been rejected with Liverpool owner John W Henry stating that the controversial striker is not for sale. On the pitch, things were more clear cut for Liverpool on a blustery and rainy day on Merseyside. Sturridge put Liverpool in front in the 37th minute when he unleashed a low shot from outside the penalty area which fizzed into the bottom corner of the net. The home side pressed for a decisive second goal in the second half but Potters keeper Asmir Begovic kept his side in the game with some fine saves. Liverpool fielded three new signings with both Spanish striker Iago Aspas -- signed for £7.2 million ($11 million) from Celta Vigo -- and Kolo Toure -- who joins from Manchester City -- making bright starts for the club. But it was new keeper Simon Mignolet -- signed from Sunderland -- who stole the show saving a penalty from Jon Walters at the death to ensure Liverpool's win. In Saturday's other fixtures, Norwich City came from behind to draw 2-2 with Roberto Martinez's Everton at Carrow Road while Sunderland lost to Fulham 1-0 at the Stadium of Light. West Bromwich Albion also opened their campaign with a 1-0 home defeat against Southampton. But West Ham United made no mistake against newly promoted Cardiff City with Joe Cole and Kevin Nolan netting for the Hammers in a 2-0 win. Jose Mourinho makes his Premier League return on Sunday as Chelsea take on Hull at Stamford Bridge. Tottenham Hotspur are also in action, traveling to south-east London to take on Premier League new boys Crystal Palace.